Yes, I did bring this to my Super Bowl Party. They were incredibly easy to make, totally paleo, and a major crowd pleaser. They ALL were eaten by the end of the game… except for the four that I saved in my fridge because I had them for breakfast this morning (with bacon on top)! Slice hard-boiled eggs in half and remove the yolks. Place yolks in a small bowl. In the yolk bowl add mustard, mayo, and spices. Whisk it all together until smooth. In another bowl, mash together avocado, red pepper flakes, garlic. Using a small spatula or spoon, fill egg with yolk mixture to the rim. 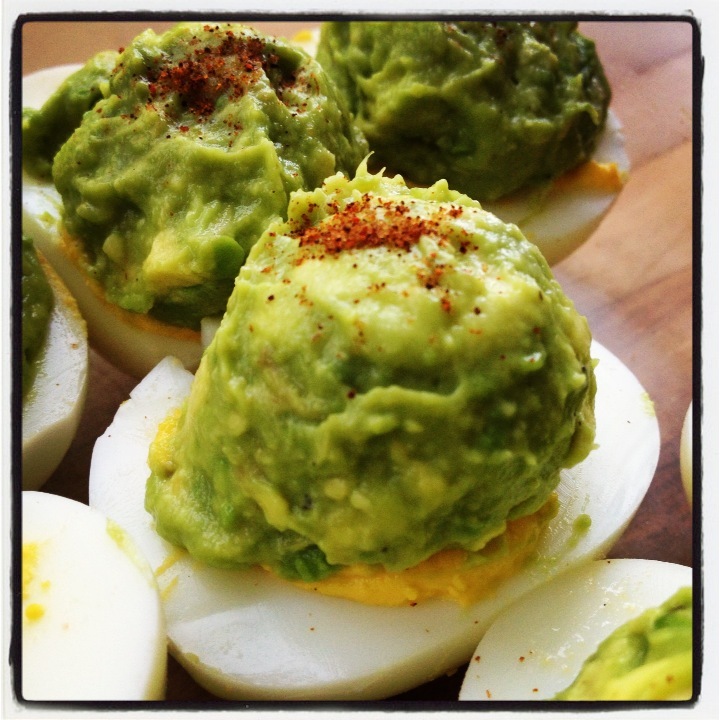 Using a small scoop, top yolk mixture with guacamole. Garnish with chili powder or bacon bits! Sounds great. Next on our “gotta try” list!